For six consecutive Saturdays, from July 20th through August 24th, fans will descend upon the world-famous polo grounds, ready to take in the sport of kings. Shamin Abas Public Relations has worked closely with BPC to create exciting new viewing venues from the chic sponsor VIP tent and lounge to expanded luxury tailgate options. Season sponsors Burgess Yachts, Gotham Jets, LaCroix Sparkling Water, Polo Gear and Town&Country welcomed guests to the sponsor VIP tent. Flowing dresses and wide brimmed hats billowed in the breeze as guests enjoyed the excitement, cooled by Bertaud Belieu Rosé and shielded from the sun by opening day sponsor Escada’s beautiful umbrellas. LaCroix created a special drink for Bridgehampton Polo called the Pink Pony that was delightfully refreshing in the 90 plus degree heat. It was a star studded affair with Amanda Hearst, Natasha Barnard, Kim Raver, Kelly Klein, Kelly Killoren Bensimon, Campion and Tatiana Platt, Gianpaolo De Felice and Gabby Karan De Felice, Donna Karan, Felicia Taylor of CNN, Daniel Benedict and Andrew Saffir. Matt Emerson, Director of the Americas for Burgess, the global superyacht industry leader, commented on their first year sponsorship, “Polo is a unique outdoor sport like yachting. It’s a very social event that draws an affluent mix. There’s a cross over crowd at polo that tend to be into yachting. It falls in line with where we want to build our brand presence.” Emerson invited his global clients and more than thirty attended the match, a chance to connect and also meet potential new clients. Burgess, which is an international full service brokerage for superyacht construction, sales, charters, and operational management, has some of its finest luxury yachts in nearby Sag Harbor such as KATYA, a 151 foot Delta Marine Yacht, and Blind Date, a 134 foot Lurssen, both of which are available for sale and charter. 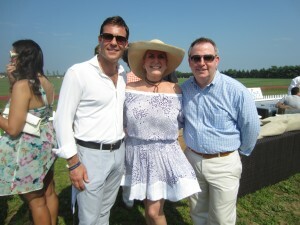 For sponsor Gianpaolo De Felice of Gotham Jets, afternoons at Bridgehampton Polo are a family affair with wife Gabby, children and mother-in-law Donna Karan enjoying the day together. He commented, “Polo is a fantastic experience. It’s great to be part of this incredible event with the horses and for us it’s great to launch this new company Gotham Jets, a private jet company with professional aviation advisors and dedicated airplanes. We’re really excited about combining service with operational knowledge.” De Felice, himself an accomplished pilot, knows the luxury private jet market well and is introducing his new company to offer exclusive fleets, access, and service. For those enjoying tailgates, Tutto Il Giorno is offering a sumptuous summer mix each Saturday from their traditional Italian fare to Hamptons favorite lobster rolls. Guests can pick up their favorites and also stop at the Prosecco bar. 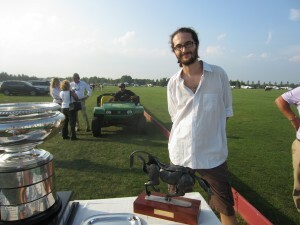 Sculptor Adrian Landon was also on hand to present his hand crafted iron sculptures as trophies for the top performers. As the announced joked, the wonderful thing about Landon’s life-size horse sculptures is that you don’t need a stall and you don’t have to clean them. 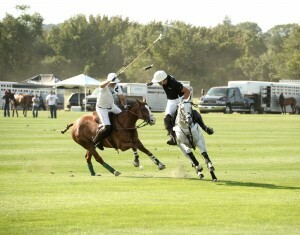 The hard fought match showcased the valiant real life polo ponies and their riders who went all out in the heat. White Birch’s Del Walton was named Most Valuable Player and Matt Emerson of Burgess presented a cooler to the Best Playing Pony Denali, played by Joao Paulo Ganon. The VIP tent will be open to guests of the sponsors and the club for Opening Day and Closing Day, while throughout the season thousands will come each Saturday to enjoy a family day out- taking in the match from a blanket, accompanied by a delicious picnic. In the VIP tent, field-side garden areas will give patrons an unparalleled view of the match. They will enjoy a pre-game reception replete with light hors d’oeuvres, rosé wine, summery cocktails and pre-match entertainment. The public is invited to enjoy the match from the sidelines, where Tutto to Go will serve refreshments each Saturday of the season. Sponsors: Season-long sponsors include: Burgess Yachts, Gotham Jets, LaCroix, Polo Gear and Town&Country. Escada is an opening day sponsor. Closing day sponsor is Ferrari North America. Tickets are available at the gate for the price of $30 per car, with proceeds benefiting the Bridgehampton Daycare Center. For more information, go to www.BridgehamptonPoloLLC.com.